Dermatomyositis is is a type of inflammatory disease characterized by muscle weakness and a distinctive skin rash. Dermatomyositis is a condition which affects both adults and children. In adults, dermatomyositis usually occurs from the late 40s to early 60s, while in children, the disease most often appears between 5 and 15 years of age. Dermatomyositis affects more females than males. Dermatomyositis is considered an autoimmune disorder, in which the immune system attacks normal body components. The immune system begins producing autoimmune antibodies that attack the body’s own tissues. This results to the proliferation of inflammatory cells surrounding the blood vessels and eventually leads to degeneration of muscle fibers. 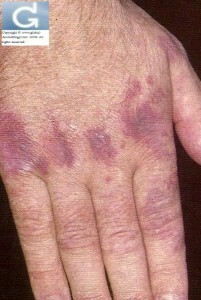 The most prominent medical finding of this condition is manifested in the skin as a violet-colored or dusky red rash. This rash is most often found on the face and eyelids (heliotrope erythema) and on areas around the nails, knuckles, elbows, knees, chest and back (Gottron’s Papules). 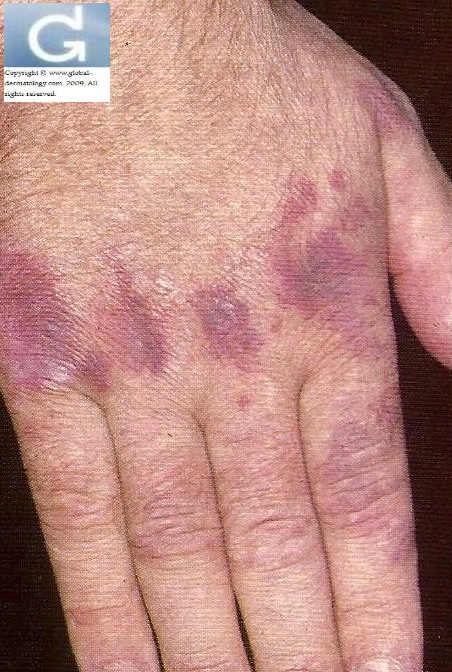 The rash, which can be patchy with bluish-purple discolorations, is often the first sign of dermatomyositis. Along with these skin changes, there may be muscle weakness involving the muscles closest to the trunk, such as those in your hips, thighs, shoulders, upper arms and neck. The weakness is symmetrical, affecting both the left and right sides of the body, which tends to gradually worsen. Patients with this medical condition often have other manifestations such as difficulty swallowing or dysphagia, muscle pain or tenderness, fatigue, fever, and weight loss. They may also have hardened deposits of calcium under the skin and gastrointestinal ulcers and intestinal perforations. Calcium deposits are common manifestations in children. So, why do we need to treat this disorder? difficulty swallowing (dysphagia) if the muscles in the esophagus are affected which in turn may cause weight loss and malnutrition. lung infections (aspiration pneumonia), because it will cause of breathing food or liquids, including saliva. If the chest muscles are affected by the disease, one may experience breathing problems, such as shortness of breath. Gastrointestinal system: Ulcers may form and bleeding can occur. Raynaud’s phenomenon is a condition in which your fingers, toes, cheeks, nose and ears turn pale when exposed to cold temperatures. Other conditions, such as lupus, rheumatoid arthritis, scleroderma and Sjogren’s syndrome, can occur in combination with dermatomyositis. Dermatomyositis may also cause the muscle of your heart to become inflamed (carditis). In a small number of people who have dermatomyositis, congestive heart failure and heart arrhythmias may develop. Interstitial lung disease may occur with dermatomyositis. Interstitial lung disease refers to a group of disorders that cause scarring or fibrosis of lung tissue, making lungs stiff and inelastic. Signs and symptoms include a dry cough and shortness of breath. Long term complications: Dermatomyositis in adults has been linked to an increased likelihood of developing cancer, particularly of the cervix, lungs, pancreas, breasts, ovaries and gastrointestinal tract. It is linked with age with a 35% chance of cancer at age 35. On the contrary, the incidence of cancer is rare in children. Perform blood tests to confirm the muscle weakness and dose markers for cancer. A blood test will let your doctor know if you have elevated levels of muscle enzymes, such as creatine kinase (CK) and aldolase. Increased CK and aldolase levels can indicate muscle damage. A blood test can also detect specific autoantibodies associated with different symptoms of dermatomyositis, which can help in determining the best medication and treatment. schedule you for magnetic resonance imaging (MRI). This is a procedure in which a scanner creates cross-sectional images of your muscles from data generated by a powerful magnetic field and radio waves. schedule you for electromyography. A doctor with specialized training inserts a thin needle electrode through the skin into the muscle to be tested. Electrical activity is measured as you relax or tighten the muscle, and changes in the pattern of electrical activity can confirm a muscle disease. The doctor can determine the distribution of the disease by testing different muscles. schedule you for muscle biopsy. A small piece of muscle tissue is removed surgically for laboratory analysis. In dermatomyositis, inflammatory cells surround and damage the capillary blood vessels in the muscle. A muscle biopsy may reveal inflammation in your muscles or other problems, like damage or infection. The tissue sample can also be examined for the presence of abnormal proteins and checked for enzyme deficiencies. schedule you for skin biopsy. A small piece of skin is removed for laboratory analysis. The skin sample can confirm the diagnosis of dermatomyositis and rule out other disorders, such as lupus. If the skin biopsy confirms the diagnosis, a muscle biopsy may not be necessary. There is no cure for dermatomyositis, but treatment can improve your skin and your muscle strength and function. The earlier treatment is started in the course of dermatomyositis, the more effective it is, leading to fewer complications. Corticosteroids may be prescribed to suppress the immune system, limiting the production of antibodies and reducing muscle inflammation, as well as improving muscle strength and function. If a corticosteroid medication is not enough, medications such as azathioprine, methotrexate or intravenous immunoglobulin (IVIG) may be prescribed. IVIG is a purified blood product that contains healthy antibodies from thousands of blood donors. The healthy antibodies in IVIG can block the damaging antibodies that attack muscle and skin in dermatomyositis. Over-the-counter drugs such as aspirin, ibuprofen and acetaminophen can be used to treat pain. If these aren’t sufficient, a stronger pain reliever, such as codeine may be prescribed. A physical therapist may be needed to teach exercises to maintain and improve strength and flexibility.If your swallowing muscles are weakened by dermatomyositis, speech therapy can help you learn how to compensate for those changes. Later in the course of dermatomyositis, chewing and swallowing can become more difficult. A registered dietician can teach how to prepare easy-to-eat foods.